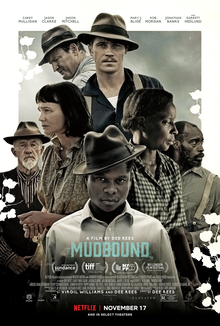 Set in rural Mississippi before and after World War II, ‘Mudbound’ is a movie about two families (one white, one black) whose lives are inextricably linked through this period by various events. It follows the fortunes and hardships of each family with a specific focus on the inherent racism of the time period and the area, as well as the affects of war on Ronsel Jackson (Jason Mitchell) and Jamie McAllan (Garrett Hedlund), men from each family who signed up. The film is directed by Dee Rees and she develops a real sense of time and place that immerses us in the lives of these characters, whilst also coaxing good performances out of the ensemble cast. The nature of the film is set up to draw parallels between the two families with a large focus on the struggles both families face in making a living in a difficult environment. Racism is a factor and forms a key part of the conclusion, but this is mostly restricted to McAllan patriarch Pappy (Jonathan Banks), an outspoken and vile racist who serves as a reminder of the attitudes of the time. This is most pronounced when Ronsel returns from Europe where he’s enjoyed a greater sense of freedom despite the war than he does back home, and his experiences lead him to challenge back against some of these attitudes to a cost. The film does dabble in melodramatic elements to its detriment, often with the scenes that focus on Carey Mulligan’s Laura McAllan, and at times I did feel the pace of the narrative lagged as Rees struggled to achieve the sweeping drama that ‘Mudbound’ is aiming for. That being said, it’s hard to criticise something this well acted and well made too much. This is a Netflix movie, and forms their latest attempt to get into the awards conversation as we start to approach that time of year. Due to that, I was unable to see this at the cinema and I do feel that something was lost as a result of watching it at home, and it’s something I’ve pondered on a lot on the back of the controversy at Cannes this year about another Netflix release (‘The Meyerowitz Stories’). My personal views probably veer more to the traditionalist side of things (or the French viewpoint), in that I believe for a film to be truly classed as a cinematic release (and therefore be eligible for awards), a reasonable opportunity should be provided for people to view the film in the cinema. The lines will likely continue to blur over the coming years as home cinema setups continue to improve and Netflix gain more of a foothold, but my current stance tends to view the Netflix releases more like high quality TV movies (much like the work HBO produce) as opposed to cinematic pieces. Digression aside, ‘Mudbound’ is a strong piece of work from Dee Rees, but I wasn’t blown away by it to the extent that many others have been.